In The Burning Crusade we saw the introduction of Haste. Haste was an interesting concept to many classes… it meant shorter cast times, shorter GCD’s, haste caps, and new itemization values. Enter: World of Warcraft – Cataclysm. With this comes the Mastery stat. Mastery will, inevitably, complicate gearing choices. Couple this with the increased importance to haste (previously outlined here) and you now have a much more complicated process than it currently is for priests. Shield Discipline: Increases the potency of all your damage absorption spells by 20% Absorption increased further by mastery rating. Shadow Orbs: You have a 10% chance for your Shadow Word: Pain and Mind Flay spells to grant you a Shadow Orb each time they deal damage. The Shadow Orb increases the damage done by your Mind Blast and Mind Spike spells by 20%. Damage increased further by mastery rating. Your Mastery Pane on your Paper Doll is very helpful. It breaks down your Mastery into it’s parts: what your Mastery Bonus does to your talent and your what Mastery Rating is providing as it’s bonus. A thing to keep in mind that any percentage shown, will show a rounded down percentage. At level 82, 298 Mastery Rating (a few questing greens) would provide a 14.68% Echo of Light, while the tooltip only shows 14%. 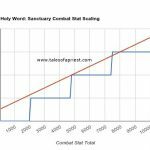 Holy’s Mastery is fairly complex, as it affects every direct heal you cast. Nearly every spell we have, with the exception of Renew (but Divine Touch counts), will provide a Echo of Light buff and heal your target every second for 6 seconds. Think of this akin to our 2pc T10 bonus, but with a 100% proc chance, and on all of our direct heals. Unlike our T10 2pc, you can overwrite your Echo of Light buff on a target with a new one…. even if it is weaker. In the below image, you’ll see that a 13,154 Greater Heal (with a 14.68%) Mastery would provide a 322 Echo of Light. However, if I were to follow up that Gheal with a Renew, I would also be healing the target with Divine Touch. This image shows, that my Divine Touch (Healing for 1707) would refresh my Echo of Light buff on the target. Congrats! You just overwrote your 322/sec Echo of Light with a 42/sec Echo of Light. Ugh… I certainly hope this methodology isn’t maintained through live, as it will force Holy Priests to pay far too much attention to the ORDER in which they cast spells. I could see this forcing Priests to not cast anything but their big heals in fear that they are being short changed on their Mastery Bonus. Discipline’s Mastery is the easiest of the 3 specs to understand: it is a flat percentage increase to your absorbs. (Power Word: Barrier, Power Word: Shield, and Divine Aegis). Sweet! Without over-analyzing it with concepts like Rapture I think that it is an awesome bonus. Arguably, you could see Mastery becoming more valuable than Spellpower(Intellect) for Disc Priests. Remember, Spellpower provides a linear increase to shields, while Mastery is exponential (% bonus) and will scale as your Spellpower increases. How will gear drop’s “itemization points” vary for Intellect/Spellpower and Mastery? Gems? Enchants? —time will tell. Shadow’s Mastery is another easy one— more damage is more damage. Your Mind Blast and Mind spikes are directly buffed by the presence (and stacks) of your Orbs. The only trick, which I’ll leave to my shadowy brethren to number-crunch: is it better to hold off on your MB nuke for 3 stacks, and continue to Mind Flay, or MB on cooldown regardless of Orb Stacks? Quick Target Dummy tests showed me that for a higher sustained DPS, it seems better to hold wait for 3 stacks. In the current build your Orb Proc Chance is fairly high, add in Harnessed Shadows, and stacking to 3 orbs isn’t too difficult. However, without a DPS meter on beta and the fact that combat text is bugged, exact math and analysis should be held off. Mastery has the potential of being a very potent stat for all 3 Priest Builds. It, at the very least, will bring some thought provoking analysis to our gearing decisions. Alternatively, will Mastery become Cataclysm’s version of Armor Penetration? This nebulous stat with complicated calculations? I think some refining will need to be done before we see this go Live, but overall I am pretty impressed with the new stat! All of the information in this post is based off of Beta Build 12803 and, of course, is subject to change.